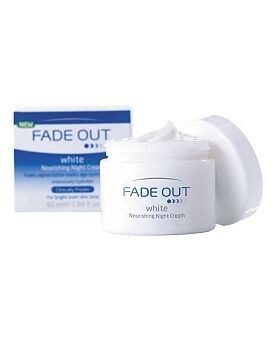 Fade Out White Nourishing Night Cream's rich formula works overnight to nourish and hydrate, helping repair from within. Overall skin tone will appear much more even, and look refreshed and revitalised. Aqua (Water), Glycerin, Sodium Lactate, Lactic Acid, C12-15 Alkyl Benzoate, Cetearyl Alcohol, Glyceryl Stearate, PEG-100 Stearate, Dimethicone, Macadamia Ternifolia Seed Oil, Stearyl Alcohol, , Ethoxydiglycol, Niacinamide, Ceteareth-20, Phenoxyethanol, Glycyrrhiza Glabra (Licorice) Extract, Morus Nigra Leaf Extract, Sodium Saccharin, Methylparaben, Panthenol, Tocopheryl Acetate, Parfum (Fragrance), Disodium EDTA, Glyceryl Oleate, Arctostaphylos Uva Ursi Leaf Extract, Butylparaben, Ethylparaben, Isobutylparaben, Propylparaben, Ascorbic Acid Polypeptide, Geraniol, Citronellol, Ascorbyl Palmitate, Tocopherol, Citric Acid. I used the Fade Out White Nourishing Night Cream in conjunction with Fade Out White Protecting Day Cream, which are two of the five products in this range of face creams aimed at brightening the skin and lightening age/dark/sun spots. Both creams were particularly thick and felt heavy on my face. Added to that I found neither sank in well and my face felt quite greasy and uncomfortable. The night cream was especially heavy and clammy feeling, causing my face to feel stuck to my pillow case, not nice! This may suit those with extremely dry skin but even so I would apply sparingly to begin with. I found the fragrance quite unpleasant and slightly chemical. The worst part for me, and this I appreciate is only my experience and may not be for all, but I found this slightly irritating on my skin and with continued use of around three weeks or so I started to come out with tiny bumps under the surface of my skin, which weren't obvious to look at but felt very unpleasant, almost like very fine sandpaper - which is not good! I then only applied to the small areas on my cheeks where I have some sun spots but it continued to irritate. Therefore I had to discontinue use of these so did not get to see if they lightened dark spots. I would be interested to know if this worked for others. Cant think of any as did not suit my skin - nice ceramic pot?! "I used the Fade Out White Nourishing Night Cream in conjunction with Fade Out White Protecting Day Cream, which are two of the five products..."